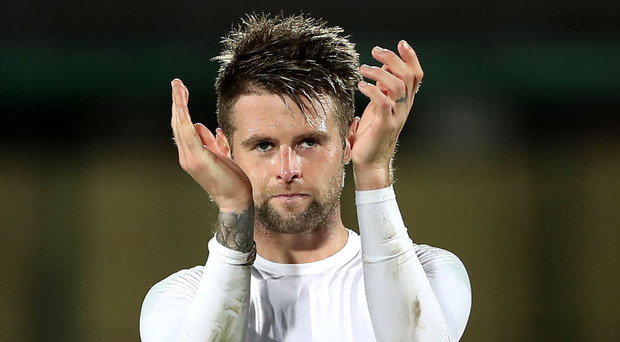 Could Oliver Norwood be playing in white this season? Northern Ireland midfielder Ollie Norwood has been linked with a deadline day move to Leeds United as new manager Marcelo Bielsa focuses on strengthening his midfield. The 27-year-old is out of favour with Brighton boss Chris Hughton and spent all of last season on loan at Fulham, helping them gain promotion to the Premier League. The likelihood of the former Manchester United youth star getting regular football at the Amex this season appears just as slim, and the prospect of frequent starts would appeal to him. The Burnley-born star is valued at around £1.5m, however reports suggest Leeds would be willing to stump up the cash for the classy central midfielder. Norwood would initially provide cover for the injured Adam Forshaw at Elland Road, and would add another quality option to Leeds' midfield four once Forshaw returns. Should the move be pushed through by today's 5pm deadline, Norwood would be available to play against Derby County on Saturday. The Whites have also been linked with another Northern Ireland player, George Saville, in recent days as Bielsa endeavours to improve his options in the centre of the park. Saville is still in the mix for a deadline day move, however club Millwall are holding out for £750k in order to make a profit on the player.